HOMESTEAD, Fla. --Tony Stewart got out of his car and smiled. A 22nd-place finish wouldn't always result in a smile for the 45-year-old driver, a three-time Sprint Cup champion who ended his NASCAR career with 49 victories in 618 starts. But the smile wasn't necessarily for the 22nd-place finish. It was for all of the tributes and special moments that highlighted his day Sunday at Homestead-Miami Speedway. His car prior to the race was set apart from the rest, allowing friends and several people to come up for hugs and photos. He drove down pit road, giving crews high-fives, and led the field for a pace lap as the crowd cheered. "It is still hard to digest it all right now," Stewart said moments after climbing out of his car. "The whole day was awesome. You couldn't ask for it to be a better day. ... Probably the best part was your peers and fellow drivers and crew chiefs and crew members. "Coming down pit road and high-fiving all those guys, it made me think back to when Dale Sr. won the Daytona 500. It was just an awesome moment." While Stewart won't race in Sprint Cup again, he will be back in the seat of a race car soon. He wouldn't say when, but the planned back surgery to remove screws from the fractured vertebra that held him out for the first eight races for the season has been scrapped. Stewart's first order of business will be his annual off-road trip, and then he will likely find himself in a sprint car at at a short track soon -- something he has not done in more than two years. "No surgeries," Stewart said. "We're free and clear this year on surgeries. I don't know [when I'll race again]. Stay tuned. ... It won't be long. We aren't going to wait too long." As far as his final race, there wasn't a whole lot to talk about. Stewart was lapped in the first 75 laps and was two laps down at one point. But he was able to stay out when the caution flew in order to eventually get back on the lead lap. He even was a little bothered by where he was scored after a big wreck with 10 laps remaining. 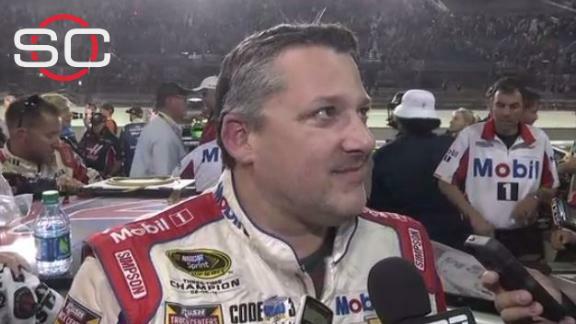 "I raced," Stewart said. "I did what I do every time I get into the car. I didn't think of anything else other than racing the race. We got behind there and tried something to make ground and had to run 60 laps on a set of tires. "At the end, the lineup there was, let's, say, confusing. I was still screaming about that just like I would on every other race. I was true to form all the way to the end." But Stewart will get over it. He had a career in which he posted 187 top-fives and 308 top-10s in 618 career starts. He finished his final season 15th in the standings, thanks to making the Chase with the win in June at Sonoma Raceway. "I'm proud," Stewart said. "It's been an awesome 21 years racing in NASCAR in the Xfinity Series and the Cup Series. ... I said all year I just wanted to be one of the guys racing and to be put out there [on that pace lap], it's an honor ,but it's humbling at the same time." Stewart felt honored in one other way -- he raced in the event where Jimmie Johnson won a record-tying seventh championship. "I was glad to race with him on the day he got his seventh," Stewart said. Tony Stewart talks with Marty Smith after finishing the final race of his illustrious career, one that saw him race just as hard all the way until the end.